Lets Talk... Janaka Abeywardhana's Blog: T20 World Cup, Can Sri Lanka Win It? The 2012 version is being hosted by Sri Lanka who also co-hosted the 50 Over equivalent. In that format twice once winning and getting to the final in the last two. In the T20 format the host nation reached the final once and the semi-finals twice. They also boast the highest run scorer (Mahel Jayawardene) and highest wicket taker (Lasith Malinga) in the format. Obviously this is all pretty impressive. The fact that this tournament is in their back yard gives them the biggest advantage it could be argued. Sri Lanka are playing Pakistan in the semi-final today (4th Oct 2012). Pakistan are seriously unpredictable. There's no middle ground, they either annihilate you or collapse like a sack of potatoes. In 2009 they annihilated SL in the final. Making into the final it's most likely Sri Lanka will meet Australia, the tournement favourites. Sri Lanka has a lot of cricketing history against Australia, special in World Cups, both beating them badly in 1996 and loosing badly in 2007. For whatever reason Sri Lanka have had trouble turning it on in finals, more often than not. Will this one be any different?! They need to move Pakistan aside first, of course. I say Sri Lanka have a 70% chance to win this title. 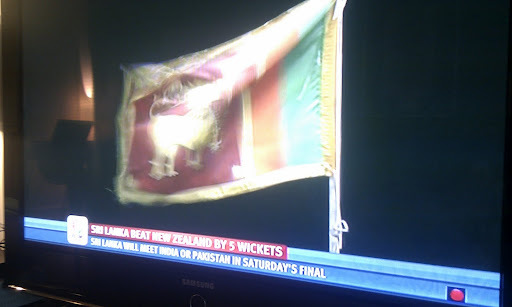 My fingers are crossed, go Lanka!